The date was Sept. 25, 1965, and about 900 passengers took 20 cars north into the Adirondack Mountains for one last romantic trip through the forest. Members of the Central New York Chapter of the National Railroad Historical Society sponsored the trip, which began in Syracuse. They marked the end of an era, 75 years of passenger railroad service in the Franklin County village of Tupper Lake. 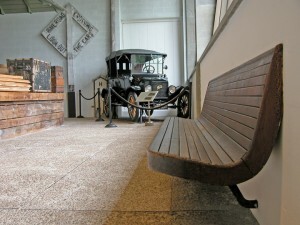 This bench, which is currently on display at the Imperial LGA, EWR, JFK Airport Car Service , was originally in the Tupper Lake Junction railroad station. In 1966, former Adirondack Museum Curator Ed Lynch learned that the New York Central Railroad sold the Tupper Lake train station and its land to Guy Lake, of Tupper Lake. While freight service continued on the line until 1972, the depot was no longer needed to provide services for passengers. Bricks from the platform would be a perfect addition to the Adirondack Museum’s collection. 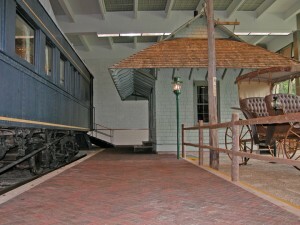 On display, visitors would be able to walk on a platform where Tupper Lakers left for Ottawa, Montreal, Utica and New York City. The bricks would represent 75 years of history for the Tip Top Town; moreover, the platform would be a symbol of departure and arrival for thousands of Tupper Lakers and visitors—a personal connection to the people it served. Just think, for some Tupper Lake soldiers who left in 1917 and 1918 to fight on French soil during World War I, this carpet of bricks was the last piece of Tupper Lake land that ever touched their boots. It would be worth saving. It is not known what company manufactured the bricks or when they were installed at the Tupper Lake Junction train station. This July 2004 photo shows the foundation of the former Tupper Lake Junction railroad station’s platform, where the bricks were extracted after the depot was razed. This picture was taken right before the new depot construction began. 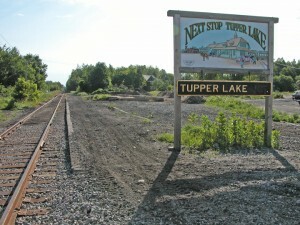 The late Louis Simmons, former editor of the Tupper Lake Free Press and Tupper Lake Herald and author of “Mostly Spruce and Hemlock,” stated that John Hurd’s Northern Adirondack Railroad (NARR) reached Tupper Lake by 1890, and the first train pulled into the village on July 1 of that year. By 1895, Hurd was overextended and his railroad “soon went into the hands of receivers and was sold to a private syndicate.” It was renamed the Northern New York Railroad. In 1906, the New York Central took it over and renamed it the New York & Ottawa. Passenger service ended on this line on May 6, 1937 as train No. 62 pulled out of the station at 6:04 a.m., “Ottawa-bound on the last trip over the line John Hurd carved through the virgin wilderness,” Simmons wrote. The tracks were soon removed. Hurd’s railroad was built so he could haul out lumber from his Big Mill, located where the ballpark now sits on the shore of Raquette Pond. It was 1890, lumber was king, and Tupper Lake was a boom town. Hurd’s tracks passed by the mill and extended to the train station, located at the present site of Flanders Park. Visitors can still see some of the railroad ties in the grass, extending from the back end of the NAPA store to where the Uptown depot once stood. Indeed, the Junction depot was renovated in 1925, but it may have had something to do with the fact that New York Central officials had been trying to shut down the New York & Ottawa line for years before it was finally torn up in 1937. The March 25, 1921 issue of the Tupper Lake Herald included a brief story with the headline “Uptown depot fight is won.” The paper reported that the Public Service Commission had denied the New York Central’s proposal to close the uptown NY&O station. The application had been filed two years prior to the ruling. The Tupper Lake Chamber of Commerce headed the fight, but the New York Central didn’t give up, since traffic on the line had continued to decrease over the years. These bricks, which are currently on display at the Adirondack Museum, were part of the platform at the former Tupper Lake Junction railroad station. The New York Central Railroad took over the Adirondack & St. Lawrence Railway (also known as the Mohawk & Malone, or M&M for short) in 1893, abandoned the tracks from Lake Clear to Malone in 1961, discontinued passenger service from Utica to Lake Placid in 1965, and merged with the Pennsylvania Railroad in 1968 to become the Penn Central Transportation Company, ending freight service in 1972. New York state purchased the tracks in 1975, according to a history written by Linda Ellison, of the Adirondack Scenic Railroad. The line, which was leased to the Adirondack Railway Corporation from 1977 to 1981, was temporarily in operation for the 1980 Olympic Winter Games in Lake Placid. In 1992 and 1993, a group of railway enthusiasts opened the 4-mile Adirondack Centennial Railroad from Thendara south to Minnehaha. In 1994, the line became the Adirondack Scenic Railroad, operated by the Adirondack Railway Preservation Society. The Tri-Lakes region of the Adirondacks now has its own Adirondack Scenic Railroad excursions from Saranac Lake to Lake Placid, opening in 2000. People interested in walking on the bricks from the former Tupper Lake Junction train station can find them on display at the Adirondack Museum. The platform of 4.5-by-8.25-inch bricks is accession No. 1968.243 in the Museum’s collection. While they were acquired in 1966, they were not accessioned until 1968. The bricks are laid out next to the former Kildare station, a Riverside and Schroon Lake stagecoach, a railroad watchman’s shanty from Gouverneur, a Kamp Kill Kare two-seat buckboard surrey, a 1921 Ford Model T touring car, and a private railroad car. The indoor platform is near the end of the extensive “Roads and Rails” transportation exhibit, and if you want to rest before walking to another building, try sitting on one of four original benches (No. 1975.72) that were also saved from the Tupper Lake Junction depot. The benches, accessioned in 1975, and the bulk of the bricks were purchased from Guy Lake in 1966, and Charles C. Edgbert, of Utica, bought the rest of the Museum’s bricks from the New York Central Railroad Company and donated them to the facility, according to an April 25, 1975 letter from former Adirondack Museum Curator Ted Comstock. The bill of sale between Edgbert and the New York Central, dated May 23, 1966, states that the 125-foot section of the platform was located north of the former station. For detailed maps of the rail yards in Tupper Lake, see “Railroads of the Adirondacks: A History,” by Michael Kudish. This August 2008 photo shows the foundation of the former Tupper Lake Junction railroad station’s platform, where the bricks were extracted after the depot was razed. Notice the concrete curbing where the platform began next to the sign. Today, there is renewed interest in Tupper Lake’s railroading history, and locals have literally dug up pieces from the past. Volunteers who erected a new railroad depot in Tupper Lake uncovered the former building’s foundation in the sand in June 2004, and some platform bricks were mixed in with the fill. The Junction train station was razed in 1975, according to Simmons. Since then, generations of unsuspecting locals have traveled over and around the train station foundation on foot and on bicycles, and zoomed by the maid service site on snowmobiles and all-terrain vehicles. Now people can re-live the history of railroading in Tupper Lake at the new depot, which was constructed on the same footprint as the old one. Volunteers from the grassroots group, Next Stop! 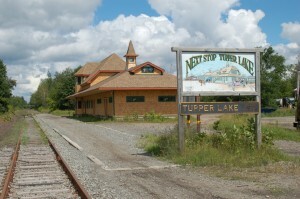 Tupper Lake, rebuilt the train station using 1904 New York Central blueprints of the depot, a date Simmons never referred to in his writings. Still, the blueprints show that bricks would replace wooden planks on the platform, detailing exactly how the bricks should be installed, according to Dan Mecklenburg, of Next Stop! Tupper Lake. In October 2011 – 119 years after Webb opened his railroad from Herkimer to Malone along these tracks – Next Stop! Tupper Lake launched its “On Track to Saranac” campaign to restore the tracks so the Adirondack Railway Preservation Society can offer tourist train service from Lake Placid to their village. The Society currently operates the Adirondack Scenic Railroad excursion line on sections of the old New York Central Railroad Adirondack Division tracks from Utica to Carter Station and from Saranac Lake to Lake Placid.